'There is commercial value to each and every thing if you have an eye for it', said Chief Executive Officer Robin Amatya of SABAH Nepal — a social business organisation based in Kathmandu — while on a recent field visit to Khar. SABAH works to empower marginalised women by offering a means to build livelihoods as home-based workers. The organisation recently became a major partner of the Kailash Sacred Landscape Conservation and Development Initiative (KSLCDI) in Nepal. SABAH Nepal joins as a partner of KSLCDI which is jointly being implemented by Ministry of Forests and Soil Conservation (MoFSC), Research Centre for Applied Science and Technology (RECAST), and the Integrated Centre for Integrated Mountain Development (ICIMOD), promoting an allo (Himalayan nettle) value chain in remote Khar VDC of Darchula, Nepal. Interventions began with Mr Gaur Singh Dhami, already an allo businessman supported by Micro Enterprise Development Programme (MEDEP) and Small and Cottage Industry Development Board. Five years into the business, Mr Dhami was still struggling to convince his family and neighbors that allo could be a viable option for alternative livelihood. Recognising the potential of allo for increasing income of large number of poor farmers the Kailash Nepal Chapter ventured to collaborate and take the allo value chain to its next level. SABAH Nepal agreed to add value at the local level and develop rural enterprise in such a way that members involved understood market dynamics and were able to sell products themselves in any prospective market. 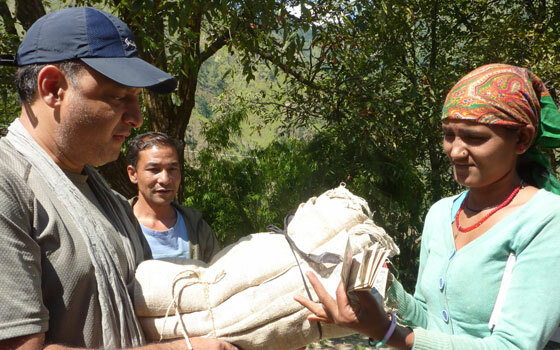 SABAH Nepal says it will focus its efforts to strengthen the supply chain. Initiatives include identifying leaders, giving them enterprise development and leadership training who will in turn serve as mentors in the community for up-scaling. Members will be differentiated into specific groups (bark collectors, wool makers, thread makers group, weavers groups and tailoring and knitting groups) based on their knowledge and ability. Leaders will be responsible to fortify specific skills into a business mode. The group began with 20 members, but today there are 76 registered members and many more interested to participate. Another group, Shree Kedarnath Allo Collection and Processing Center at Sundha Munda, recently registered for a similar allo business and membership is increasing. 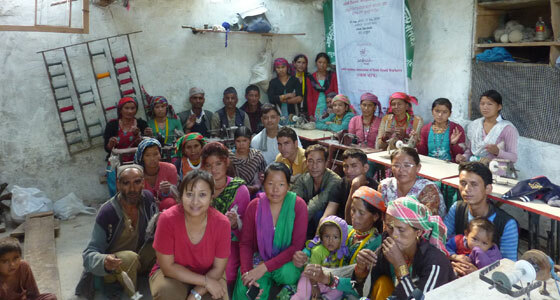 While visiting the group, Amatya, immediately understood the capacity gaps of the members. Amatya made the quick decision to arrange training and orientation for the group members on the basics of sustainable harvesting, thread making, stitching, and tailoring and knitting and to develop product lines. Understanding the need for long-term handholding, on-the-job training on product development and design for selected leaders have already been scheduled in Kathmandu in SABAH Nepal’s office. Amatya identified various product that could be tied-in with allo and sold to create a niche for Khar. One such item was “bead neckbands”, a traditional ornament. Already 100 such bands have been ordered from the group for NRs 200 per band. Women were reportedly pleased to know products they had previously made for personal use could have commercial value. While one woman brought in hemp cloth that she had woven which was also brought by him as he saw huge potential for not only for allo but for other fabric business like hemp, wool etc. However, her product was found to be of subpar quality and not marketable. This provided an opportunity for the group to stress the need for skill development and quality control, domains of the private sector.